the cheapest one is $58.. If you want to make your own bullet belt, you can get used shells & clips bulk from Westley Surplus in New West. Everywhere else I have seen that has bullet belts for sale wanted well over $100, and only one size: Anorexic. Went shopping around Vancouver on Saturday, and found three places on Granville Street that sell Bullet Belts. One was the Vancouver Rock Shop, and was the cheapest at $69 (brass only). The next place is Camouflage, at $89, but had both brass and nickel belts. Cherry Bomb also carried them for $99 (brass only). Yes the website is cheaper, but for those who can't or don't do online shopping, they can be found locally. oh yeah, and their shipping is better than onyone elses too. they only charge $5. 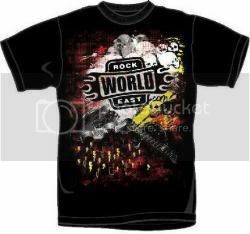 everyone else wants like $15..
http://www.rockworldeast.com This is where I bought every Metal shirt I own!